Cruising has been the fastest growing segment of the travel industry for over 20 years, and it is still booming! Our unique cruise franchise program is for those with no travel industry experience, but who are committed to building a successful business! Over 85% of the U.S. population is yet to be asked, "Would you like to cruise?" Seize the opportunity! Join An Award Winning Cruise Agency! 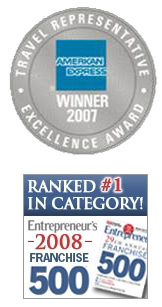 #1 Ranked in Category in Entrepreneur Magazine's 2004, 2005, 2006, 2007 and 2008 Annual Franchise 500. "What a great experience! The training class was well planned and filled with valuable information. Everyone from Cruise Planners headquarters staff was warm, friendly and very hospitable. Each aspect of the five days of training exceeded all expectations. It was very impressive to see first hand the years of experience the Cruise Planners staff have; how we as franchisee's benefit from that knowledge and the buying power it gives us with the cruise lines. The relationships and respect Cruise Planners has in the industry was evident in the three ship inspections we were able to participate in. We leave class inspired and excited on our new venture. Please express our sincere gratitude and thanks to everyone for all their hard work and for making it such a wonderful training class." "I have to say as long as it took me to make up my mind to join Cruise Planners or carry on in whatever capacity at the current agency, I am so happy with my decision to come to your company. I do hope all franchisees feel the same way and that future franchisees may read this letter and know that Cruise Planners is a very successful, lucrative and friendly company." "We look at Cruise Planners as a benchmark agency that exemplifies all that we expect from our distribution system." Cruise Planners Franchising LLC/American Express franchisees pride themselves on professional, resourceful, helpful customer service. This all begins with our Home Office staff. Our staff is dedicated to your franchise success, and we are here to help you with everything from marketing your business to entering a booking, to any sales or accounting issue that may arise. Your Success is Our Success! Cruise Planners Franchising LLC/American Express has an in-house web development team who creates professional and effective interactive web sites for its franchisees with over 25,000 pages of content. You customize your own site which not only gives you credibility in the marketplace but also provides you with an excellent marketing and communication vehicle. Cruise Planners Franchising LLC/American Express has created Proprietary software and technology that will strengthen your ability to sell and provide you with the everyday solutions to help you work even smarter. You'll be able to store and manage customer information and use it to run your business more efficiently. Own the cruise travel franchise ranked #1. Did you know you could own a franchise business you actually enjoy working? You can love what you do. Cruise Planners is a low-investment business opportunity which yields high returns with no travel experience required. Our home-based business model has a family of over 725 franchise owners and is one of the largest, privately-owned, nationally-recognized and continually-awarded cruise selling agencies in the country. Americans have trusted the brand name American Express above all others in travel for over 150 years. We are an American Express Travel Service Representative agency which lends instant credibility to our new franchise owners with a trusted, well-recognized brand. Did you know a cruise vacation is an incredible value? It's a fact: People want to travel. Studies find almost 34 million Americans plan on cruising in the next three years. And the cruise lines will be introducing 26 new ships into the waters at the same time. We will need travel agents now more than ever. It's time you joined a recession-resistant industry. We offer unique benefits to our franchise owners. 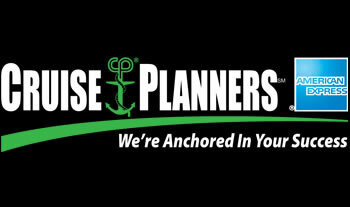 At Cruise Planners/American Express, we're anchored in your success. We look forward to welcoming you to the Cruise Planners' family. We have the team, the talent and the dedication to help you succeed. And we firmly believe your success is our success. Please note this franchise is not accepting inquiries from outside the United States. Interested parties should have at least $20,000 liquid capital to invest. Click on Request Information for FREE info on how to open a Cruise Planners / American Express franchise today! Please Note: This Cruise Planners / American Express franchise opportunity and other franchise business opportunities, businesses and franchises for sale on this web site are not to be considered as an "offering", "franchise offering", suggestion or recommendation by Franchise Leader™. This advertisement depends entirely on the truthfulness of the information provided by our advertisers which includes, but is not limited to, franchisers, franchise brokers, franchise consultants and business brokers. Franchise Leader™ recommends that you consult a lawyer, financial consultant, accountant or professional advisor before buying a franchise or business opportunity or any type of business. By using this form or any part of our website, you have agreed to all terms and conditions of Franchise Leader™. Please review our Terms & Conditions for more information.